Story Contracting’s Plant division have been award two Rail Live Awards by Network Rail at the national Rail Live event in Warwickshire. Network Rail’s Track Programme Director Steve Featherstone awarded Story Contracting ‘Most Improved RRV Operator’ and ‘Share with Pride Champion’ recognising the developments, practices and machinery that make Story one of the best operators on the Rail Infrastructure. Rail Live is the largest outdoor rail show in Europe and has been welcoming thousands of visitors for the last five years. Story Contracting ‘Most Improved RRV Operator’ comes after a significant investment of £10m in new plant machinery over the last 18 months predominantly in their Road Rail fleet with 70 machines operating out of their depots in Carlisle, Leeds and Edinburgh. The award was given to Story for their work as early adopters and driving support for the national plant reliability programme. The programme was developed by Network Rail to pioneer best practices and implement measures which are helping to raise plant operator standards across the UK. 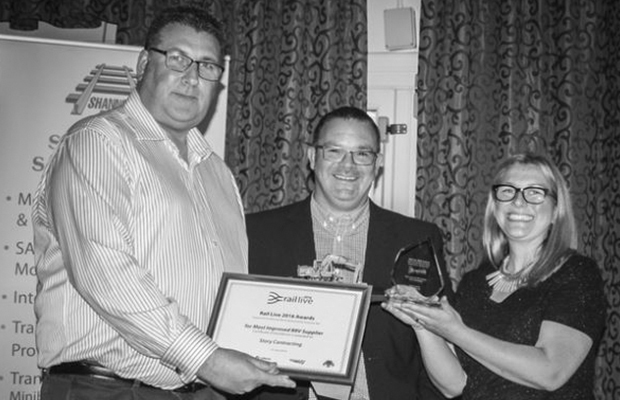 The ‘Share with Pride Champion’ award was given in recognition of Story Contracting leading the field for plant reliability across the UK and adopting new and innovative technology that allows them to deliver more successfully and eliminate risk from works for theirs clients and staff. “It is great to be recognised nationally for the service we offer our clients. We have invested heavily in our fleet over the last couple of years but more importantly we have developed our people to ensure we continue to be one of the best operators on the rail infrastructure. Story Contracting have an increased work bank over the next five years secured and the opportunities for local employment in Carlisle, Leeds and Edinburgh are very encouraging.